Amy Lynette - Seeking and Sharing Him, season after season. Seeking and Sharing Him, season after season. Last night we tried a new recipe and am so glad that we did! The recipe made a pot full and we have plenty leftover for lunches in the next several days. Its simple enough for a weeknight dinner but I think would be great to serve guests! All of the flavors of traditional lasagna in a simple one pot soup recipe! I used Italian sausage but next time I will use ground beef because that’s what I normally use in my lasagna. The cheese mixture on the bottom was my favorite part! So creamy and delicious. Place your sour cream and cream cheese in a small bowl, with a dash of salt, and allow them to come to room temperate so you can combine them to use with your finished soup. Set aside. Turn your pot on saute, normal function and add a tsp of oil and once it displays HOT, swirl the pot around to coat the bottom with the oil. Add in your meat, onion, and celery. Break the meat up and saute(7-8 minutes) until most of the pink is gone. Drain the fat off of the meat, then add in the sauce, tomatoes, bouillon, uncooked pasta, and the seasoning. Do not add the sour cream mixture now! Give the soup a good stir, check your seal, put on the lid and lock it, and put the value in the seal position. Cook on high pressure for 5 minutes! While it’s cooking, give your sour cream mix a good stir and place a hefty spoonful into your serving bowls. Do a quick release once your 5 minutes is finished. Open the lid carefully and set aside. Ladle the hot soup into your bowls that have the white mix in the bottom and top with a generous portion of the Italian cheese blend. Enjoy! New to the world of InstantPot and pressure cooking? Check out my review here! 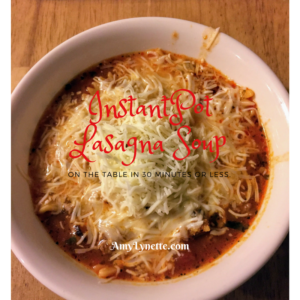 This entry was posted in InstantPot, Recipes and tagged easy dinner, InstantPot, lasagna soup. Easter is all about Jesus!